Home » The Staff » Elizabeth R.
Elizabeth was born in Fort Worth, Texas and raised in Weatherford, Texas. She has been in the eye care industry for over 10 years, has been one of our all-star Opticians and Eye Wear Specialists since 2014! 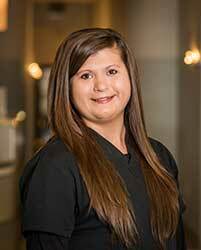 Her industry experience includes specialty training with Essilor and Zeiss, Texas State Optical Camp Classes, and exclusive on-site training. In her spare time, Elizabeth enjoys shopping (especially at thrift stores), traveling, watching movies and going to concerts. She also has a creative side and likes to color and make collages when she can find the time. When Elizabeth isn’t taking care of patients, she’s taking care of her small zoo. She currently has two dogs, two red-eared slider turtles, two Sphynx rats, and two fancy rats that keep her busy! Elizabeth’s outgoing personality and passion for her job will make your next frame buying experience your best one yet!